With its majestic harbor, picturesque waterfront towns, and stunning coastline, the area around Valletta is packed with tourist attractions. Along the Grand Harbor across from Valletta are "The Three Cities," Vittoriosa, Senglea, and Cospicua, with a heritage tied to the Knights of Malta. Valletta's Marsamxett Harbor is lined with modern seaside resorts, including the peaceful district of Ta 'Xbiex, the hopping tourist town of Sliema, and the trendiest spot, Saint Julian's, with a bustling restaurant scene. Farther afield is the Blue Grotto, a gorgeous nature site on Malta's southern coast, and the fishing village of Marsaxlokk, a perfect place for an authentic seafood lunch. Traveling inland rewards with marvelous historic towns such as Mdina, a completely enclosed medieval world, Naxxar with its impressive aristocratic Maltese palace, and several enchanting country villages that offer a taste of Malta's traditional lifestyle. The most popular day-trip destination for organized tours is the idyllic Island of Gozo, which delights visitors with its sandy beaches, rural landscape, and fascinating Neolithic sites. Find the best adventures near the city with our list of the top-rated day trips from Valletta. The dreamy little island of Gozo has a far-away, lost-in-time feel but is only a 30-minute ferry ride from the port of Cirkewwa (a one-hour drive north of Valletta) on the Island of Malta. Gozo is the ideal destination to escape from it all while admiring sublime Mediterranean scenery and sunbathing on the sandy shores. Yet there's more to this island paradise than beautiful beaches and balmy weather. Gozo surprises visitors with its quaint country towns, charming fishing villages, historic cities, and fascinating prehistoric archaeological sites, surrounded by a patchwork of farmlands and a coastline of striking beauty. Top attractions on the Island of Gozo are the seaside resort of Marsalforn and the expansive fine-sand beach at Ramla Bay. Tourists can switch gears from sunbathing and swimming to soaking up culture in the capital city of Victoria. Perched on a hilltop, this walled medieval town is enclosed with a well-fortified citadel that overlooks the sun-drenched countryside. Victoria astounds visitors with its panoramic views, stately sandstone buildings, and a splendid 17th-century Baroque cathedral that displays sumptuous works of art. The most fascinating tourist attraction on the Island of Gozo is the UNESCO-listed Ggantija Temples. Dating to the Neolithic era, the two prehistoric temples at this site were built between 3600 BC and 3200 BC. Thanks to the solid structure of durable limestone blocks weighing up to fifty tons, the megalithic temples are incredibly well-preserved considering they are among the world's oldest monuments. In fact, Ggantija Temples predate other ancient World Heritage Sites including England's Stonehenge and the Pyramids of Giza in Egypt. Adding to the allure, the archaeological complex is surrounded by a picture-perfect Mediterranean landscape with sweeping views. An Interpretation Center helps visitors to understand various aspects of Neolithic life, providing insight into theories of the temples' ceremonial use. To visit the Island of Gozo as a day trip from Valletta, it's advised to take an organized excursion that provides hotel pickup and round-trip transportation. One option is the Gozo Day Trip, which includes a guided tour of the Ggantija Temples, a scenic drive along Xlendi Bay, and a stop at the historic capital city of Victoria. In its unique Mediterranean topography and sparkling azure waters, Malta's Blue Grotto is similar to the famous Blue Grotto on the Island of Capri in Italy. This dazzling nature site along the dramatic southern coast of Malta is part of a system of six limestone caves that were created by the force of waves over millennia. A winding road alongside a sheer cliff leads to the little harbor in Wied iz-Zurrieq, where boats depart for guided tours of the Blue Grotto. The best time to visit is in the morning until about 1pm, when sunlight floods into the caves and the pools of seawater take on a brilliant cobalt-blue glow. The serenity of Malta's Blue Grotto belies a storied past. According to ancient Greek mythology, sirens bewitched sailors here. In more recent history, on the eve of the Great Siege of 1565, a Maltese cavalry squadron defended against the Turkish Armada at this location. Today, tourists can expect nothing more turbulent to occur here than inclement weather that may cause Blue Grotto boating tours to be canceled. Another must-see tourist attraction near the Blue Grotto (less than two kilometers away) is the UNESCO-listed Hagar Qim Temples archaeological site. Dating to around 3600 BC, this prehistoric site stands on a rocky promontory high above the Mediterranean Sea. To visit both the Blue Grotto and the Hagar Qim Temples, try a full-day tour that includes stops at Malta's top tourist highlights: the Blue Grotto, Hagar Qim Temples, and Marsaxlokk. Today Mdina is known as "The Silent City" befitting its quiet, unpopulated ambience. In a spacious courtyard at the center of the town, the Cathedral of Saint Paul dazzles visitors with its awe-inspiring sanctuary and breathtaking ceiling paintings. Just outside the city's ancient ramparts is a pastoral landscape of olive groves and vine-covered rolling hills. Idyllic vistas are found at the Palazzo Falson and Palazzo de Piro museums, which both have cafés with outdoor terraces, as well as at Bastion Square. Soaking up the scenery on languid summer days is a memorable tourist experience. Other enjoyable things to do include attending classical music concerts at the Palazzo de Piro and Baroque music concerts at the Carmelite Priory. Considering that Mdina is a city so rich in history, the best advice for tourists is to take guided tours of the historic sites. For travelers who'd like to visit Mdina along with other top destinations outside of Valletta in a day trip, the best option is to take an organized tour. The Malta Sightseeing Tour includes a guided walk through Mdina and then continues with a coastal drive to the Dingli Cliffs and a stop at the magnificent Mosto Rotunda church. On a hilltop overlooking the Valletta harbor, Vittoriosa (also known as Birgu) is the most important of the Three Cities, the original settlements of the Order of Saint John (Knights of Malta) until they built Valletta. The second oldest town in Malta and the oldest maritime capital, Vittoriosa has been inhabited since the ancient Phoenicians, and later, the Romans settled here. 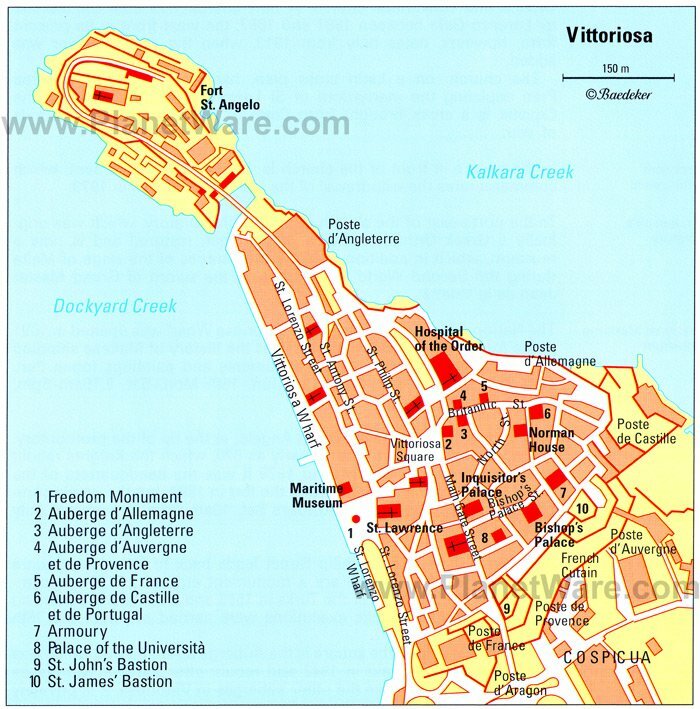 Vittoriosa was one of the earliest headquarters of the Knights of Malta, who enlarged and strengthened the town's existing fortifications. The Grand Master Juan de Homedes created the bastions of Fort Saint Angelo, separated from the town by a moat with a drawbridge. This fort, together with Fort Saint-Elmo in Valletta and neighboring Fort Saint-Michael, allowed the Knights of Malta to defend against the Turkish attack during the Great Siege of 1565. Vittoriosa has the authentic ambience of a small Maltese town. Few tourists are found wandering the cobblestone pedestrian streets. Neighbors socialize at church and at the cafés, and children play games in the village's hidden squares. Stroll through the town to discover the historic buildings: the Inquisitor's Palace on Triq Il-Palazz Ta' L-Isqof, the Norman House on Triq it-Tramuntana, and the Auberge de France (residence of the French Knights) with its palatial facade on Triq Hilda Tabone. Keep wandering to the Auberge d'Auvergne et Provence and the Auberge de Angleterre (residence of the Knights of England). Stop at one of the nearby cafés hidden on the side streets and then meander down to the harbor to see the Church of Saint Lawrence, the 16th-century church of the Knights that was designed by Malta's most renowned Baroque architect Lorenzo Gafà. Another attraction on the Vittoriosa waterfront is the Maritime Museum (housed in the old Naval Bakery), which tells the story of Malta's seafaring history. Standing on a promontory jutting into the Grand Harbor, this small historic town is another of the Three Cities. The promontory was fortified in 1551 by the Grand Master Claude de la Sengle, the town's namesake. (Senglea is also known by its Maltese name L-Isla.) The Fort Saint-Michael at the tip of Senglea's promontory, along with Fort Saint Angelo in Vittoriosa, protected the town from invading Turks during the Great Siege of 1565. Because of the residents' heroism during this battle, the Grand Master Jean de la Valette awarded Senglea the title of "Citta Invicta" (Invincible City). Senglea's 16th-century parish church is dedicated to the Nativity of the Virgin Mary. The church was built as a tribute to the victory after the Great Siege of 1565, and in 1921, Pope Benedict XV gave the church the title of a Basilica. The church was badly damaged during World War II. More than 15 years of renovation have restored the church to its original beauty. Like Conspicua, Senglea suffered during the Second World War with more than three-quarters of its buildings destroyed. One of the highlights of Senglea is its breathtaking view over the harbor. An excellent viewpoint is found in Safe Haven Gardens at Senglea Point. On the bastion point is a lookout post known as Il-Gardjola with an eye and ear that symbolize vigilance. Another viewpoint is at the watch tower, a relic of Fort Saint-Michael on the tip of the promontory. Visitors will be awed by the sweeping panoramas of the Grand Harbor, the skyline of Valletta, and the little towns surrounding the capital city. heavy bombing during the Second World War. About 10 kilometers from Valletta, Marsaxlokk is an ancient Maltese fishing village on the southeast coast. With it expansive harbor of deep turquoise waters bobbing with hundreds of colorful fishing boats, Marsaxlokk is a sight to behold. The sun-scorched landscape of oleander bushes and palm trees hints at the proximity to Tunisia. (Unfortunately the otherwise idyllic scenery is blighted by an electricity power plant in the distance.) The architecture also has a North African influence. Along the waterfront streets, notice the ribbon of weathered stucco houses with shutters and doors in bright shades of red, green, and yellow. The Maltese fishing boats, called luzzus, are also painted vibrant primary colors and feature two eyes in front. These "Eyes of Osiris" are meant to ward off evil spirits, a custom that comes from North Africa. Marsaxlokk remains the fishing capital of Malta, yet strong traditions and a tightly knit community have preserved its village charm. The village centers around a lovely Baroque church and bustling town square overlooking the harbor. The best time to visit Marsaxlokk is during the Fish Market on Sunday mornings. Stroll along the palm-tree lined waterfront that is packed with fish vendors and souvenir stands. Afterwards stop for a seafood lunch at one of the village's restaurants in the town square or near the harbor. Tartarun Restaurant is the most highly regarded seafood restaurant in Marsaxlokk. The restaurant treats patrons to daily fresh-caught fish prepared simply in Maltese style as well as other authentic seafood, side dishes, and salads. To discover some of Malta's most pristine seaside scenery, continue two kilometers away from Marsaxlokk to Saint Peter's Pool. This secluded site delights visitors with one of the most beautiful natural swimming pools in Malta. The crystal-clear waters are perfect for swimming and snorkeling (ladders offer access to the sea). Flat rocks around Saint Peter's Pool provide sunbathing areas and there are shaded areas as well. Saint Peter's Pool is popular with locals; it's usually not crowded because of its remote location. Keep in mind that this is a secluded nature site with no facilities (no restrooms and no lifeguard). The site is only accessible by car, and it is recommended to park on the main road and not on the poorly maintained road at the top of the cliff. Also nearby is the archaeological site of Tas-Silg on a hilltop overlooking the turquoise waters of Marsaxlokk Bay. The Tas-Silg site includes ruins of four different historical periods. There is a settlement dating back to the Bronze Age, a temple of the Tarxien period (3000 BC to 2500 BC), a Greco-Punic temple to the Goddess Astarte, and an early Christian chapel (1st century AD) The pottery, ivory, and stoneware uncovered on the site indicate that the Greco-Punic temple may have been the Temple of Juno, which was looted by Verres, the Roman governor of Sicily and Malta around 70 BC. Naxxar was once a sleepy farming village, but urbanization expanded the town and has linked Mosta and Naxxar together (a short bus ride or drive away). Legend has it that Saint Paul first received and dried his robes over the fire after the shipwreck here (Naxxar means "to hang clothes to dry"). Saint Paul is also said to have preached at this site. In the saint's honor, at the center of town, is the 17th-century Church of Saint Paul, with a grand Baroque facade and an elaborate Neoclassical interior. The top tourist attraction in Naxxar is the Palazzo Parisio. This glorious 18th-century Maltese and Italian-style palace was originally built by Grand Master Manoel de Vilhena in 1733. Palazzo Parisio is still a private home owned by an aristocratic Maltese family. The palazzo impresses visitors with its grandiose rooms and opulent decor-delicate ceiling paintings, beautiful antique furniture, precious works of art, and extravagant gold-leaf moldings. The immense Grand Staircase was crafted out of a solid piece of marble from Carrara, Italy. The ornately gilded and mirrored ballroom dazzles visitors and is rented out for private weddings. In the music room, the chaise lounges are gilded with 24-carat gold music motifs. The dining room is adorned with its delicate frescoes that recall paintings found in villas of ancient Pompeii. Palazzo Parisio's sensational Baroque interior is matched by its enchanting Italian-style garden, immaculately landscaped with Mediterranean trees and shrubs, citrus trees, fragrant herbs, and seasonal flowers. Some of the plant arrangements were created by gardeners from Sicily. Another highlight of the palace is the Luna Restaurant, which serves gourmet Maltese and international dishes for lunch and dinner on the inviting garden terrace or in the elegant dining room. The Luna Restaurant has won "Top Ambience" awards because of its romantic setting. The palace also offers a traditional English afternoon tea experience; exquisite teas, fresh scones, finger sandwiches, homemade tea cakes, and pastries are presented on fine china in an intimate, luxurious environment. During the summer months, families with kids flock to the Splash & Fun Water Park in the seaside community of Bahar Ic Caghaq (five kilometers from Naxxar). The park features exciting water slides, a dive pool, and children's pool. Parents will appreciate the casual restaurant and barbecue nights. For a wide selection of restaurant options and a lively atmosphere, Sliema, just across the harbor from Valletta is a great choice. However the town offers little in the way of charm or historical value. Once a small fishing village, Sliema has become a touristy holiday destination overdeveloped with modern high-rise hotels. Travelers seeking Old World ambience and authentic Maltese culture are better advised to stay in Valletta. Sliema's main attraction is its Strand, the seaside promenade lined with hotels, restaurants, shops, and cafés. The Strand invites visitors to take a leisurely stroll or enjoy a meal at a waterfront terrace. There are no real beaches, only rocky areas for sunbathing. Some spots have ladders leading to the sea and cordoned-off swimming areas. The Sliema waterfront is the departure point for the ferry to Valletta and for boat trips to other locations in Malta such as the Blue Grotto, the Island of Gozo, and the Blue Lagoon on the Island Comino. For an in-depth tour of the Valletta Grand Harbor, take a Grand Harbor Cruise. This cruise gives tourists a view of Valletta's impressive defense fortifications, the towns around Valletta, and the scenic yacht marinas within the creeks of the Grand Harbor. Noteworthy monuments in Sliema are Saint Julian's Tower, a coastal watchtower, and the Baroque-style Parish Church of St. Julian, originally built in 1682 and enlarged in 1848. The town celebrates the Feast of Saint Julian the last weekend of August. During this joyful festival, the church is illuminated by multicolored lights, and monumental statues are brought out from the parish church into the streets during a procession. The religious festival includes several days of marching band parades and fireworks. Visitors will not want to miss the festival's street stalls that sell Maltese delicacies such as nougat and other sweets. The only reason for tourists to visit Mosta is to see its parish church, but it is certainly a worthwhile sight. The Parish Church of Saint Mary is known as the Mosta Rotunda or Mosta Dome, named after its dome which is one of the largest in the world. The dome is so immense that it is visible far in the distance from many different points on the island of Malta. The spectacular Neoclassical church was designed by Grognet de Vassé and construction began in 1833. It took 27 years to build the church, and the entire dome was constructed without the use of scaffolding. The exterior and interior of the church come close to being a replica of the Pantheon in Rome that was built in the 1st-century AD, except that the Mosta Dome is ornately decorated and brighter. The massive towering dome features a ceiling pattern that mimics the geometric pattern of the ancient Pantheon, albeit with gilded and pastel blue painted details. With light flooding through the 16 ceiling windows, the light and airy sanctuary has an inspiring celestial ambience. The floor of the church reveals intricate marble inlays that weave an interplay of patterns to mirror the ceiling. Evocative religious art and lavish wall paintings are displayed throughout the chapels of the sanctuary. The murals were painted by Guiseppe Calì. Mosta is famous for having survived the bombing of World War II. In April 1942, a large Luftwaffe bomb pierced through the dome but did not explode. At that moment, more than 300 people were in the sanctuary for evening mass. This event is known as the "Miracle of Mosta." The spot where the bomb entered the dome is still visible in the ceiling, and a replica of the bomb is displayed in the Sacristy. This slow-paced country village is rich in culture and history, boasting a heritage of producing olive oil. The town's name derives from the word "zejt," which means oil. During September, Zejtun hosts an Olive Festival, with olive oil tastings, music, and theater performances. Also of interest to tourists are the village's historic churches. At the spacious main square is the 17th-century Parish Church of Saint Catherine featuring a marvelous facade that combines Maltese Baroque and Romanesque architectural elements. This church is considered one of the finest accomplishments of architect Lorenzo Gafà. Brightened by its internal dome, the interior has a harmonious quality. Above the main altar is an 18th-century copy (the original is in the Church of Saint Catherine in Valletta) of The Martyrdom of Saint Catherine by Mattia Preti, the renowned painter from Calabria in Italy. Every year on the third Sunday of June, the town of Zejtun celebrates Saint Catherine's Feast Day with marching band competitions, processions, and fireworks. Zejtun has another remarkable house of worship, the Church of Saint Gregory. Built in 1437 when Zejtun became one of the island's 10 parishes, this is one of Malta's most interesting medieval churches. The building has a simplistic and austere facade, and the reddish dome is the first of its kind in Malta-dating from 1495. The nave is original; it has a somber ambience and conceals a hidden door that was probably used centuries ago during pirate raids. Saint Gregory's Feast Day is the first Wednesday after Easter, which is considered the beginning of the Maltese summer season. The legendary festival includes a procession from Zejtun to the nearby village of Marsaxlokk, about two and a half kilometers away. This scenic bay has deep spiritual and historical importance tied to Saint Paul, who is considered the Father of the Christian Church in Malta. Saint Paul was shipwrecked on an island in the bay in 60 AD during his journey from Caesarea (near present-day Haifa in Israel) to Rome. The Maltese people believe that it was Saint Paul himself who introduced Christianity to the local population. There is a Statue of Saint Paul near the spot where the Apostle was thought to be shipwrecked. Saint Paul's Bay was once a little fishing village but has expanded to include the communities of Qawra, Bugibba, Xemxija, and San Martin. The bay offers beautiful natural areas and splendid coastal views of the open sea. A waterfront promenade runs the entire course of the bay, ideal for a gentle walk. The nearby Mistra Bay has a pebble beach with crystal-clear waters. Close to Saint Paul's Bay on the Wardija Ridge, tourists can find the mysterious Cart Ruts that reveal the island's ancient heritage. Just five kilometers from Marsaxlokk, this old Sicilian fishing village has a quaint seaside charm. The town was built around a picturesque bay, where fishing boats and yachts are docked in the calm waters. Marsaskala is a pleasant place to visit and stroll along the waterfront. The charming ambience and wide selection of restaurants tempt visitors to stay for a meal. It's an obvious choice to try the fresh seafood that is locally caught and prepared in traditional Maltese style. Overlooking Marsamxetto Harbor, this pleasant district of the Valletta surroundings is called Ta' Xbiex (which comes from the Maltese word "tbexbix" meaning sunrise) because of its spectacular views in the glow of morning sunlight. Ta' Xbiex is home to many embassies and a noteworthy yacht marina. Some of the most expensive yachts are docked at the marina, and the Royal Malta Yacht Club in Ta' Xbiex hosts regattas throughout the year. For tourists, the appeal of Ta 'Xbiex is the waterfront promenade. Visitors can take a walk along the quays to stroll past the stately villas and fancy yachts. The promenade runs all the way from Ta'Xbiex to Saint Julian's. Along the way are many restaurants with outdoor terraces that take advantage of the serene seaside location. In a small bay immediately north of Sliema, Saint Julian's district was once just a humble little fishing village with a chapel dedicated to Saint Julian. Today, the district is a very popular tourist area near Valletta (less than 10 kilometers away). Saint Julian's is especially bustling during the holiday high season and on summer nights, when a young and hip crowd hits the trendy restaurant scene. 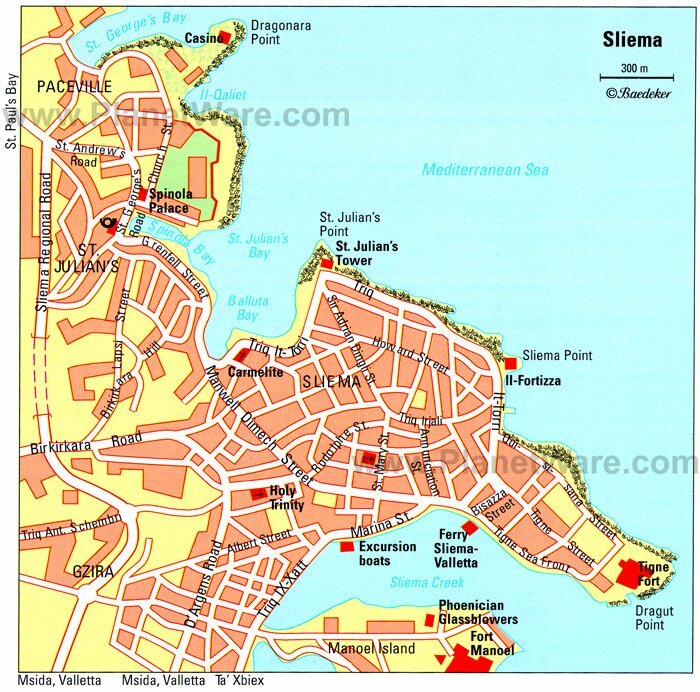 Like Sliema, Saint Julian's offers plenty of accommodations with a wide variety of hotels, from budget to upscale. Saint George's Bay of Saint Julian's district appeals to a well-heeled clientele because of its luxury hotels and private beach clubs. However, Saint George's Bay also has a large public beach with a sandy shoreline. Originally the beach was rocky, but the local council shipped in sand to improve the beach. Another selling point, Saint George's Bay has wonderfully calm waters; the beach is known as a "Blue Flag Beach" thanks to the placid waves (and no undercurrents) and is ideal for swimming. Nearby, around Balluta Bay, is a rocky shoreline and a tiny sandy beach, located just beneath the promenade that extends from St. Julian's to Sliema. Vacation-goers enjoy sunbathing on the sandy beach and even on the flat rocks of the shoreline. During summertime, the area is great for outdoor activities: swimming, snorkeling, and water sports. Balluta Bay is well equipped with facilities for water-skiing, windsurfing, and water polo. Birzebbuga began its life as a typical Maltese fishing village. Now, it is a popular seaside resort in Southeast Malta, about four kilometers from Marsaxlokk. The town was built around the Pretty Bay, which has an attractive sandy beach as well as many waterfront cafés, restaurants, and shops. The first weekend of August, the town celebrates the Feast of Saint Peter at the Parish Church. Festivities include fireworks, a marching band parade, a procession in which Saint Peter's statue is carried around the town's streets, and kiosks selling Maltese treats like nougat and other local specialties. In a tranquil valley just outside the village of Birzebbuga is a fascinating archaeological site, Ghar Dalam. This prehistoric cave dates back to the Neolithic era (7,400 years ago) and is the earliest evidence of human inhabitants in Malta. There is also another prehistoric cave nearby, the Borg in-Nadur Cave, that dates back to the Bronze Period. The characteristic Maltese fishing village of Kalkara is next to Vittoriosa along the Grand Harbor, in an area filled with dghajjes, the Maltese gondola-like boats used for transportation to Valletta. A popular tourist attraction in Kalkara is Fort Rinella, a 19th-century British fort famous for its 100-ton cannon. The cannon was developed by the Victorian-era Lord William Armstrong of Newcastle, England. The cannon can fire a one-ton shell up to 12 kilometers in distance. Fort Rinella is open Monday through Saturday 10am to 5pm; at 2pm is a historical reenactment event featuring cavalry and military drills. To the north of Fort Rinella is the 17th-century Fort Ricasoli that has been pictured in several movies and TV shows. In the center of Malta about six kilometers from the Valletta city center, Birkirkara is known for its antique shops and numerous churches. Most of Birkirkara is modern, but the historic part of town has atmospheric narrow streets and alleyways. The Parish Church of Saint Helen's is considered one of Malta's finest Baroque churches. This grandiose church was built between 1727 and 1745 towards the end of the Maltese Baroque period. Intricate details distinguish the Sicilian-influenced exterior, with its decorative classical pilasters on the facade. The spacious Latin-plan interior is adorned with rich frescoes. Every year in August, the Feast of Saint Helen is celebrated with a religious procession, marching band, and festive events. Another noteworthy house of worship in Birkirkara is the Parish Church of Saint Mary designed by Vittorio Cassar in the early 1600s, when Renaissance design was merging with Baroque style. About 10 kilometers from Valletta, the small medieval village of Gharghur has an appealing old-world atmosphere. Visitors can stroll around the maze of ancient streets to discover the village's charm. Gharghur has two noteworthy churches: the 17th-century Parish Church of Saint Bartholomew, designed by Tommaso Dingli, and the Church of the Assumption, originally built in 1560 and rebuilt in 1650. For those who like outdoor activities, Gharghur is a good point to set off on cycling and hiking expeditions and countryside walks. An easy six-kilometer walk begins at Gharghur and leads to the nearby village of Attard, surrounded by a profusion of orchards. The quiet village lives up to its motto "Florigera Rosis Halo" (which translates to "Perfuming the Air with Blossoms") because of its wonderful gardens. Attard's San Anton Palace, the official residence of the Maltese President, features an expansive botanical garden that is open to the public. One of the prettiest gardens on the Island of Malta, the San Anton Garden is landscaped with billowy palms, lush plants, and vivid flowers, which makes it an especially inviting place to take leisurely strolls, admire colorful blossoms or relax on a park bench under leafy trees. The Villa Bologna in Attard, the Prime Minister of Malta's residence, has a large private garden that is used as a venue for weddings, private parties, and special events.